Parking is available in the pay-and-display car park in Clapham, where there are also toilets. There is a very small layby at the top of Riverside, likely to fill early in the day. You may be able to park on the street in the village. The first section of the walk is through the privately owned Ingleborough Estate nature trail, and a small fee (60p per person in 2010) is payable at a car-park-type machine, which allows the visitor to walk along Clapdale Drive, beside the artificial lake created by Ingleborough Hall owner Reginald Farrer in the Victorian era. The nature trail is also the route to the Ingleborough Cave showcave, the entrance of which is passed shortly before entering Trow Gill. From the national park car park, cross the beck by either of the two bridges and turn right up Riverside. The road bends to the left and the entrance to the nature trail is immediately to the right. For alternative starts to the walk, avoiding the private section, see below. The walk passes an artificial limestone grotto as it wends through Clapdale Wood before emerging into open land shortly before the entrance to the cave. The thumping of the siphon pumping water up the hill will be heard in the vicinity though, as all the children who visit Santa in the cave around Christmas know, it’s actually his helpers hard at work preparing all the gifts. Rather than taking the path into the Farrer estate, walk a few yards further along the road and take the lane to the right, rising up the hill with first on the left, then on the right. Do not take the walled track to the left, but continue along the open track to reach Clapdale Farm, passing through the yard then turning right, down the hill to join the Clapdale track just beyond the private section. Another route out of Clapham village is to follow Church Avenue, along the eastern side of the beck, to the churchyard but, instead of following the road over the bridge to the left, continue to the right, under the culvert, and rise up to join the track of Thwaite Lane. Where Thwaite Plantation ends, turn left along Long Lane, another track, for 1.25km before taking the footpath on the left to cross the footbridge at the end of Clapdale Wood, or continue along Long Lane for a further 900m and take the next footpath on the left to drop down into the valley and join the main path from Clapham just before Trow Gill. Trow Gill is a limestone ravine carved by glacial water but now dry. There are climbing routes on either side and you might spot rockclimbers on a dry day. Follow the gill over the bouldery floor to its narrowing head, emerging out into a constricted valley in open country. Follow the path, keeping the wall to the left, before crossing the wall. A few yards after crossing the wall, Bar Pot is visible on the left – one of the main entrances into the Gaping Gill system for potholers. After 300m, the main path towards Little Ingleborough forks to the left, but a detour to Gaping Gill, taking the right fork, is essential for everyone except those in the biggest of rushes. 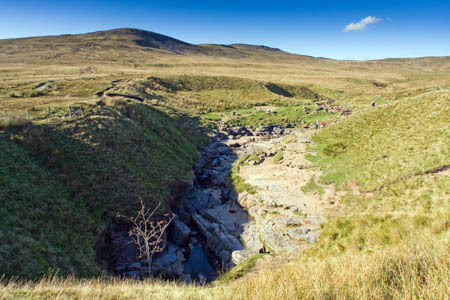 The shakehole in which the opening sits is fenced at its southern side, but a path leads down to the flat rocks beside the last few metres of Fell Beck before it plummets 160m (520ft) into the main chamber before emerging 1.7km south with a different name. The dangers of the open shaft of Gaping Gill should be obvious and the limestone around it can be slippery. Don’t add to the number of fatalities by getting too close! From Gaping Gill, rejoin the main path leading to the summit of Little Ingleborough, which then flattens for a while before the final ascent diagonally on to the plateau at the top of Ingleborough itself. In good visibility, the cross shelter should be visible; otherwise careful navigation will be needed to ensure finding the summit landmarks on a fairly featureless plateau.